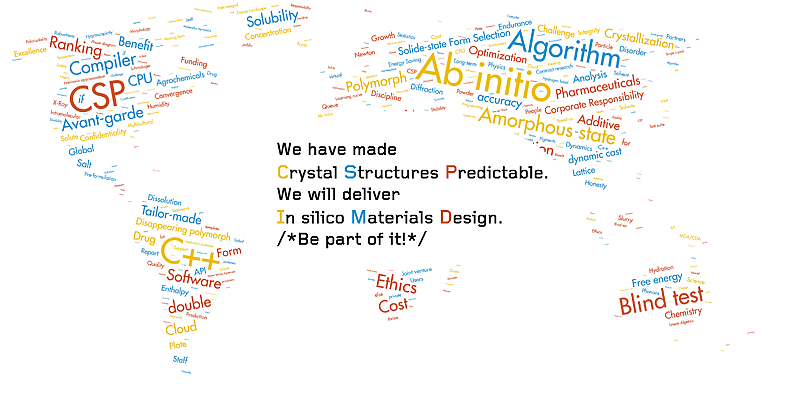 Avant-garde Materials Simulation is the world-leading provider of software for organic Crystal Structure Prediction (CSP). We have successfully competed in the last three CSP blind tests and are pioneering other areas of predictive materials modelling. We rapidly deploy new technology to leading pharmaceutical companies. We put the principles of sustainable development into practice and offer an industrial working environment with an academic touch. We are a multi-cultural team that develops software for a global market. Our offices are located in Freiburg (Merzhausen), Germany, on the border of the Black Forest. The city has a rich student life with a variety of places to unwind after work. The residential areas offer green, calm neighborhoods that are ideal for healthy lifestyles and families with children. Close to France and Switzerland, the Black Forest is one of Germany´s most touristic regions known for the beauty of its lakes and landscapes. In the wintertime the region offers good opportunities for alpine and cross-country skiing. The position is part or full time and permanent. You will report to Dr. Marcus Neumann, the Founder and Director of Avant-garde Materials Simulation, and to the Head of Human Resources and Communication, M.A. Elsa Gheziel-Neumann on specific projects. By designing, creating and managing a secure and efficient IT environment, you play a key role in enabling AMS´staff to focus on the development of novel approaches in molecular modelling. You are responsible for managing, maintaining and developing all aspects of IT infrastructure like desktop clients, server and network and support the HPC Specialist to manage the Linux cluster. You develop, review and adjust our security policy and ensure its application. You provide security training and technical support to other staff members. You perform regular backups and software updates. You manage our web site in close collaboration with our Communication Manager. You interface with our suppliers of technical services (air-conditioning, electricity, telecom, alarm system, etc). •	You feel confident to openly report difficulties and errors whenever needed. Even to customers! We are a small family business with short communication paths. The impact of your work is immediately visible and directly supports other team members. We aim to provide a professional environment in which people from all over the world at different stages of their lives can find the work-life balance that suits them. Because we care about our employees, our customers´needs, scientific progress and the planet, working at AMS does have a meaning. •	What matters most to us, beyond your skills and experience, is your mindset. Sharing common values is the basis for a happy Team! Tell us more about your philosophy at work and your soft skills in the cover letter, to be addressed to our Head of Human Resources and Communication, M.A. Elsa Gheziel-Neumann. •	We will first collect applications, and give you a feed-back until the end of March via Email. •	Upon successful completion of a Skype interview and some hard-skills tests, you will be invited to Freiburg for a series of interviews and tests with AMS Management. •	The position will remain open until the ideal candidate is found. Research Scientist ; Trilingual Secretary ; Overview open positions ; Why should you work for us?